Vultures. Cartoon characters in parched deserts often wish them to disappear, since circling vultures are a stereotypical harbinger of death. But, joking aside, vultures in some parts of the world are in danger of disappearing. And according to a new report from University of Utah biologists, such a loss would have serious consequences for ecosystems and human populations alike. The primary threat to vultures, according to the report published today in Biological Conservation, is the presence of toxins in the carrion they consume. On many continents, vultures are the unfortunate victims of poisoned carcasses — especially impactful because dozens — or even hundreds — of vultures can feast on a single carcass. Populations of most vulture species around the world are now either declining or on the brink of extinction. 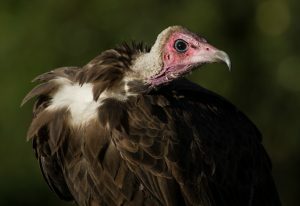 Losses of vultures can allow other scavengers to flourish, according to biologists Evan Buechley and Çağan Şekercioğlu. Proliferation of such scavengers could bring bacteria and viruses from carcasses into human cities. Evan R. Buechley releasing an adult Egyptian Vulture in Armenia after tagging it with a satellite tracking device (visible on the back of the bird). This device will allow detailed tracking of the movements in order to investigate where this endangered species is breeding, feeding, and migrating. 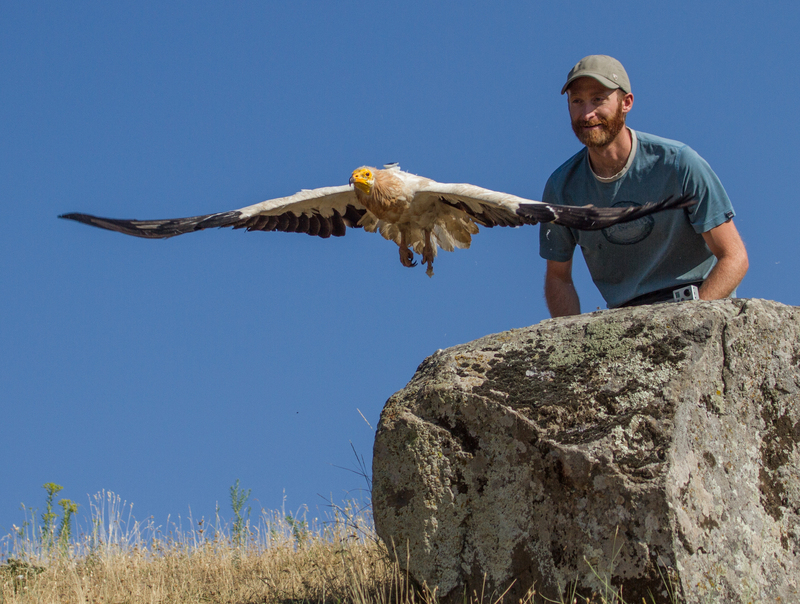 Such technology is important for identifying critical habitat for the conservation of endangered vultures. In 2004, Şekercioğlu published a study examining the respective extinction risks of all bird species throughout the world. He noted then that vultures represented the single most threatened group of birds. Now, more than a decade later, Buechley and Şekercioğlu have examined factors affecting the extinction risk of more than 100 bird species, including 22 species of vultures, which eat carrion exclusively, and other scavenging birds that have broader diets. Their results suggest several inherent ecological traits that likely contribute to vultures’ extinction risk, including their large body masses, slow reproductive rates and highly specialized diets. The greatest external threat to vultures, however, is poisoning. An adult critically endangered California Condor that was released into the wild in the Grand Canyon region of Arizona. 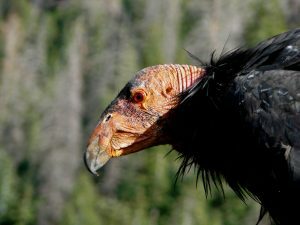 California Condor populations are recovering across North America with extensive conservation efforts after reaching a population low of only 22 individuals in the 1980’s. Now, the center of the vulture crisis is in sub-Saharan Africa. “In Africa, it’s a lot more challenging,” Buechley says. “It’s a darker story.” Potent newly affordable poisons are used to control predatory pests, such as lions or jackals. The poisons are so toxic that they can cascade through ecosystems: birds, mammals and insects are often found littering the area around these poisoned carcasses. But, as the predominant scavenger, vultures take the brunt of the poisoning and face the largest number of casualties. For example, an elephant carcass poisoned in Namibia in 2007 killed as many as 600 vultures. In other cases, vultures are the victims of poachers who poison carcasses so that vultures do not give away the location of illegally taken animals. “Vultures are taking the hit, indirectly, for a lot of this human-wildlife conflict, as well as the illegal trade in animal parts,” Buechley says. This crisis, unfortunately, is ongoing. 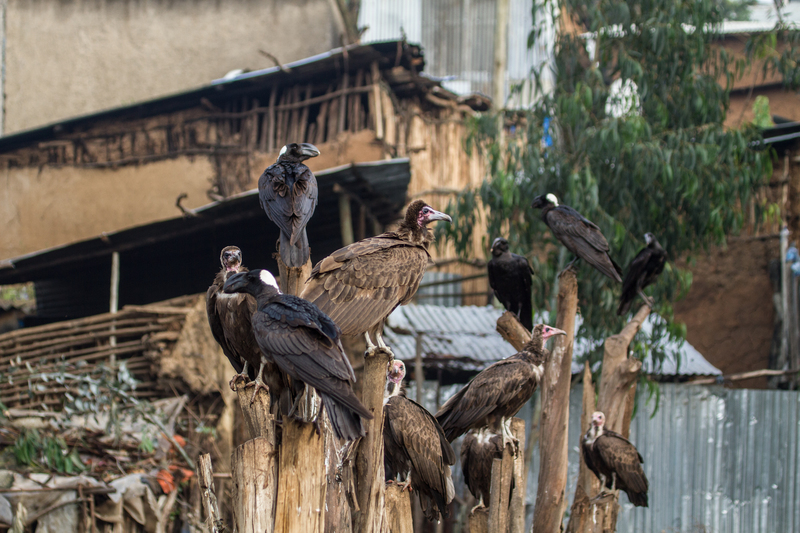 Hooded Vultures and Thick-billed Ravens searching for food in an urban setting, Addis Ababa, Ethiopia. Crows, rats, dogs — any of these species can suddenly become abundant and dominant, to the point of crowding out the remaining vultures. Hundreds of vultures on a carcass can easily frighten away packs of dogs, Şekercioğlu says. But when only a few vultures are left, the dogs can rule. 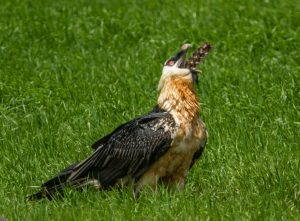 At a road-kill dog carcass in Ethiopia, a Bearded Vulture, the only vertebrate osteophage (bone-eating specialist), swallows a large section of dog vertebrae whole. For example, following the decline of vultures, India experienced a strong uptick in feral dogs —by an estimated seven million. The increase in dogs, potentially feeding on disease-ridden carcasses, is thought to have at least partially caused the rabies outbreak that was estimated to have killed 48,000 people from 1992-2006 in India — deaths that may have been avoided if not for the disappearance of vultures. But with few vultures and unable to properly handle their dead, the Parsis experienced a crisis within the faith. Some constructed captive vulture aviaries. Others talked about desiccating bodies using focused solar mirrors. The Parsis’ plight exemplifies the vultures’ role in south Asian society — and the various impacts if the vultures aren’t there. An adult Hooded Vulture in Ethiopia. The once common Hooded Vulture was uplisted to critically endangered in 2015 because of drastic declines in populations across Africa. Hooded vultures are dying primarily from poisons in the carrion they eat. Although the vulture crisis in Africa is ongoing, Buechley and Şekercioğlu can predict what the outcome will be, based on previous experiences in India. Crows, gulls, rats and dogs will boom. And the rabies outbreak in India may just be a prologue, because several sub-Saharan Africa countries already have the highest per-capita rabies infection rates in the world. Rabies is only one of the many potential diseases that vultures had helped regulate. Buechley notes that the poisoning that is killing vultures is also affecting many other organisms throughout ecosystems. But vultures are the most sensitive canaries in ecological coal mines. The story of the California condor shows that recovery is possible, but at a high cost that countries in the developing world may not be able to pay. The study was funded by a National Science Foundation Graduate Research Fellowship and by the University of Utah’s Global Change and Sustainability Center. A Lappet-faced vulture displaces a Ruppell’s vulture from a road-kill dog carcass in Ethiopia. Two Lappet-faced vultures subsequently feed on and drag the carcass away. Video by Evan Buechley. Dozens of Pied crows and Thick-billed ravens feeding on animal waste in Addis Ababa, Ethiopia. Vultures remove waste from the environment, including cities in developing countries, which is an important ecosystem service that helps control populations of facultative scavengers like dogs and rats and also helps to regulate disease outbreaks. Video by Çağan Şekercioğlu.